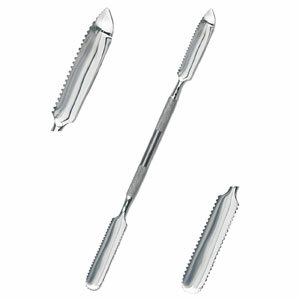 This double ended serrated chrome spatula was designed for the sculptor working in Plastilina and wax as well as mold making and casting. Each end of this rust-resistant sculpting tool is uniquely shaped for precision modeling. One end is rounded with serrations on both sides; its inverse end comes to a point and has serrations on one side only, the other being straight-edged. Can be used on conical as well as straight surfaces. The serrations enable the artist to texture the surfaces with light or heavy pressure.